My work this year explores materials, natural and manmade; their seductive beautiful qualities; how they decay, and some of the cultural, historical and geographical contexts. Much has changed in my lifetime and I have appreciated the benefits of new technologies, medical advances and travel opportunities; I welcome the new ideas these generate. During my sailing years along British, French and Mediterranean coasts, I was very aware of environmental issues, particularly the impact of plastics and toxic waste. Plastic as containers and packaging are light and in so many ways a cheap and practical solution, but they also present a bigger problem. Distribution by air and water as microplastics is all too easy. Marketing thrives on rich colours and type. So seductive. So slow to decay, if at all. Recent climate changes are highlighting the importance of much more awareness and collaboration if our fragile ecosystems are to be maintained. I am hoping for some exciting conversations at my Open Studio this year. Before then I have several trips to London planned for more research. 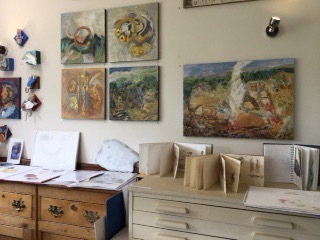 The last twelve months have flown by, my Open Studio in May was once again well attended with some fascinating conversations and also some sales. In June I travelled to the Italian Alps to learn more about the Iron Age rock art at Valcamonica. This has been found all the way up the wide glaciated valley, the two main sites show schematic figures and animals, some which are believed to be maps. Our guide said the whole valley still contained much more waiting to be excavated. We then travelled to the Austrian border to see Otzithe well preserved natural mummy of a man who lived between 3400 and 3100 BC,he was found in the glacier by two climbers. After the long hot summer,which was wonderful but not very conducive to doing much work, I was ready for Naples in early September. What a wonderful crazy city it is, so unlike others I have visited over the years. Modern Naples for all its similarity to Rome, has a very earthy unique street life. The trip was mainly to look at the historical sites around the Bay of Naples, where the rich Romans had their villas – I got to see the elegant museum in Naples and the exquisite mosaics from Pompeii, and to visit the remains of early Roman hot springs. What impressed me most were the layers of history from the Greeks and Etruscans which linked up with my trip in 2016. Most of the autumn and early winter has been spent at leisure studying this rich collection of impressions. You can find more information on the Open Studios website and now find me on Instagram @small_worlds_artist. It is always good to see and chat with all my visitors, both new and returning. 2018 is rather special for us, as its been running very successfully in Sheffield and South Yorkshire for 20 years. Pick up a brochure, that is if you can find one! Or search the websites for artists information. It’s a great showcasing of creativity in our vibrant city. Please do search it out. You will be richly rewarded. My journey unfolds through sketchbooks. My degree was in fine art, painting. I enjoyed working on large oils, printmaking etc but portability took on a new meaning when my husband and I took up 25’ small boat sea cruising. My thrill and excitement come not through a camera lense, but paint, canvas, pens, papers, and small diverse materials often recycled. Two dimension flows into three. My models called ‘Small finds’ and ‘Small Worlds’ are lightweight, portable, and suit my present lifestyle. This third dimension opens so many new viewing points, light possibilities, textures and materials. They sum up, and excite me, as much as the initial visual experience, but I think of them as a development of ideas and connections about the present and future, especially of materials, and tools, over millenia. They are not made as a craft copy of the original artwork, rather a maquet or small sculpture. My interests also are also concerned with movement. Change within the natural world, geological and culturally. The transformation and transportation of small handmade items embracing people’s beliefs and comfort in life and afterlife. This year my work is grouped into areas of interest. There is information for some pieces, so please feel free to ask me about them. The models are reasonably robust and may be handled very gently. The sketchbooks may be handled carefully but not rubbed. Models and some art work is for sale. The overall theme is Earth, Fire, Air and Water. All of significance to Sheffield and South Yorkshire. From Iron Age brooches, to crucibles, and the archaeology found at Whirlow in 2016. Icelandic lava flows to marine life. Journeys from Alaska to Japan. I hope you enjoy your journey as well. So what has been happening since the beginning of May? Well a reasonable number of visitors came to my one open weekend this year; next year I plan on opening for both weekends. There was plenty of interest in my small models, and work related to the Time Travellers dig at Whirlow in June and July 2016. The sun even shone occasionally, so Dore is once again on the map. Since then there has been much more interest in archaeology across Sheffield. Our Whirlow site archaeologist Clive Waddington gave a talk on the dig to a packed audience at King Ecgbert School in the spring and his full report is due out soon. 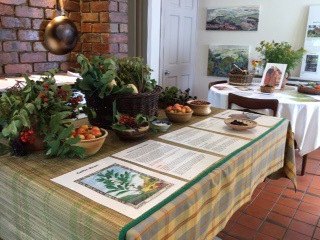 Mid May saw a Heritage Day featuring Whirlow Hall Farm through the Ages – a fun event but with a clear message to schools and all ages that history is worth exploring and sometimes surprisingly relevant to today. My small models which began with an idea to develop the Dragonesque brooch in 3D have taken on a life of their own! All my work explores the connections between artefact, context and landscape and has infinite possibilities, The models are small, portable and tell of different viewpoints; imaginative, sometimes serious, conceptual or with a humorous twist. And of course, all my work is for sale. If you are curious to know more then do drop in to my next Open Studio that I’ll be hosting this August with friends from the Time Traveller group, it will have a wider theme of the Iron Age and the Brigantes tribe of the north, and link art work with history, everyday life, medicine and religion. No charge, informal and to exchange ideas! From Friday 18th to Monday 21st August – 32 Townhead Road, Dore 11am – 5pm daily. Thank you to all visitors to my studio this year, I had some really good conversations and lots of interest in the work I’ve been doing recently. Here’s some pictures of the studio taken in a quiet time. Remember, I’ll be open again in August 2017 to talk with some of my collaborators about our research into the Brigante tribe of northern Britain, and I am happy to receive visitors by appointment, so please email me. Drop in any time between 11 and 5 on any of those days. For details take a look at the www.openupsheffield.co.uk site. What’s changed? Well, my work has continued to evolve over the last year, and you’ll see that I am influenced increasingly by my interest in the metalworking of the northern Britain Brigante tribe of 2000 years ago. I’m continuing to explore 3d model making on a small scale using a variety of materials from card to dried Chinese mushrooms. Note, my studio will also be open later in the year from Friday 18th to Monday 21st August. Digging a big trench for ourselves! A queen in northern Britain? Surely there was only Boudicca and she was based farther south?. That autumn, Geraldine, Mary, Dorothy and myself set out to research more about this Queen and her Brigante tribe. We’d been advised that they hardly existed, what a challenge! ; even the Romans knew the Brigantes were the largest Iron Age tribe or confederation in northern Britain? We quickly found out just how biased some of the Roman reporting could be. Naturally as the conquerors, and with a sound latin language in place they certainly had a distinct advantage in terms of being believed, although sometimes they were writing 10 years after the event, and from Rome. Then there is the problem of the money available for archaeology and the magnetic attraction of “Treasure Trove”, with funding being allocated for sites containing spectacular hoards. These have a bigger draw for visitors to museums. Dare I say it, a north south divide? The history of 2000 years ago can seem a very difficult challenge today, especially as we understand the Romans to be so organised, technically skilled and so brilliant at networking. Where is the evidence of the native population of Britain? The last 30 years has seen some rethinking. Much more archaeology is being identified.The Portable Antiquities Scheme which records small finds made by the public across Britain, not just “ treasure trove” has opened our eyes to more domestic artefacts. Far more questions are being asked, we have some wonderful technology to detect sites, and of course the internet connects these things together. Even if you have little interest in history these advances will have affected you. Our northern Queen Cartimandua, has suddenly come centre stage in the archaeology world. Her place of residence was most likely at Stanwick, near Scotch Corner. A site of some size and comparable with others in the south of Britain. How do we know? Well a heavy book of archaeological reports, comparing all the digs done on this site has just been published this spring, and this is informing new research. How did I come to be involved? Well Whirlow is part of my childhood territory. From being a very small child I crossed the fields from Bents Green to visit many relatives in Dore and Totley. I explored the roads to Ringinglow visiting Sheephill farm and Burbage by bike. I was always hoping to unearth something from this ancient landscape especially across Whirlow fields and what we knew as “the Roman Road” at Ringinglow. By a strange “twist of time”, and many adventures elsewhere, I now live back in Dore, picking up threads from the past and those of my life experiences. My fine art degree has linked with family metalwork and design occupations in Sheffield with which I was involved when working in the city. So where better to begin a new and fascinating trail from Whirlow across Europe to Italy and back. I could empathise with all those ancient traders, carrying materials and metals to and from the Mediterranean. In 2012 I found a small enamelled Dragonesque brooch, made in the late Iron Age in Brigantia, it was tucked into a modest display in the Doncaster Museum.The creature had a very lively shape, still retained some colour and seemed carefully made.This was when I started to become really interested, and began my new art work and research. Saturday 30th april, Sunday 1st May and Monday 2nd May – 11 am – 5pm. Find me in the brochure on page 33, or on the site www.openupsheffield.co.uk.